The Central Adelaide Hills is quickly accessed from Adelaide via the South Eastern Freeway, but more scenically via Greenhill Road, Norton Summit Road or Old Norton Summit Road. This part of the region covers everything from Lobethal to Mount Barker, and Belair to Kanmantoo, and includes the Onkaparinga Valley (Verdun, Balhannah, Oakbank, Woodside and Charleston). It is the ideal place to base yourself to be central to all the region has to offer. 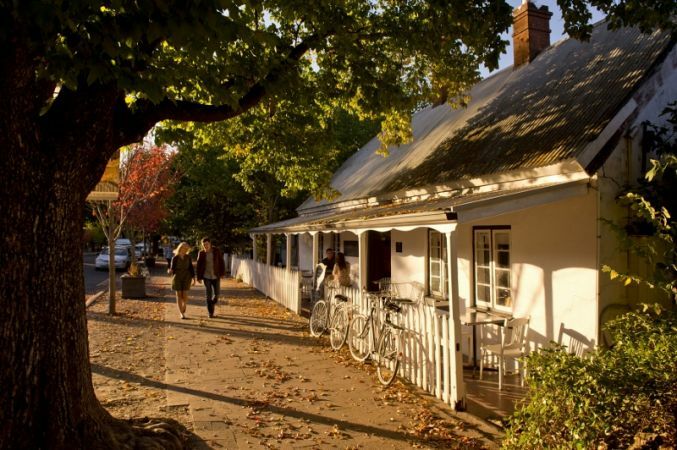 The historic township of Hahndorf featuring German heritage, winery cellar doors and craft breweries, strawberry picking, farm experience for the kids, cooking school, artisan cheese-maker Udder Delights, and a main street lined with shops, galleries, pubs and restaurants. Don't miss The Cedars, the home, studio and garden of Australia's most famous landscape painter Sir Hans Heysen. Hahndorf offers a diverse range of accommodation. The garden village of Stirling with excellent dining, shopping, cooking school, historic pub and wide range of accommodation. Mount Lofty Summit at Crafers for views of Adelaide, dining, souvenirs and visitor information. Mount Lofty Botanic Garden at Crafers for a stunning display of the world's cool-climate plants that thrive in the Adelaide Hills. Cleland Wildlife Park at Crafers for the chance to interact with native Australian animals including opportunities to hold koalas and reptiles daily. The township of Woodside with pubs, cafes galleries and shops, along with Heritage Park which is home to Melba's Chocolate Factory and Woodside Cheese Wrights. The township of Oakbank which is home to the Easter horse racing carnival - the biggest picnic horse race meeting in the world. O'Leary Walker Wines is located in the town's historic former Johnston Brewery. The township of Lobethal which is home to the old Onkaparinga Woollen Mill featuring boutique cellar doors and the Lobethal Bierhaus craft brewery. The Lobethal Christmas Lights are a much-loved tradition and draw many visitors every night from mid December until the end of December. Historic Bridgewater Mill for fine dining and the Bridgewater Inn next door for excellent pub fare and a beer garden perfect for long lunches in the warmer months. The thriving city of Mount Barker with a rich history, excellent shopping and dining, cinema complex, Mount Barker Summit, Laratinga Wetlands, sporting facilities and excellent playground and skate park. As the Adelaide Hills' largest centre and one of the fastest growing areas in the state, Mount Barker provides a comprehensive range of services. It is also home to the SteamRanger vintage steam train. The iconic Aldgate Pump Hotel in Aldgate along with a delightful cluster of shops and cafes, beautiful gardens and B&B accommodation. Littlehampton - home of Four Oaks Farm for farm experiences including horse riding, horse trail rides and kids pony parties. Belair National Park for wildlife, adventure playground, walking, bike riding, horse riding and tennis picnics. Cherry, apple and pear orchards are common throughout this area in places such as Lenswood, Forest Range and Basket Range - see Food Experiences for information on picking your own fruit.